Technological advancements are happening constantly in today’s world, and these changes are creating opportunities for investors to profit. INN has developed a series of free reports on technology-focused topics to help investors navigate this quickly changing market and decide where to put their money. From blockchain to security to clean technology, you can explore what options work best for you. We have the perfect report for tech investors looking at a diverse set of stocks across technologies and industries. Find out all you need to know about major tech investing trends in our report. Mobile web technologies are only gaining traction as cloud services diversify and data becomes more valuable. Read our report to understand the newest trends and most promising companies in the market. Blockchain has already gone beyond cryptocurrencies——creating new oppurtinites for investors in the market. Find out what’s new in blockchain. Bitcoin is still fighting for legitimacy in the market, even if it stopped being a speculator’s dream investment. Find out what’s changing. Read our brand new free report to learn about promising new companies in the 3D printing space. Investors can profit from a much larger and diverse market. Find the best fintech stocks in the market this year. 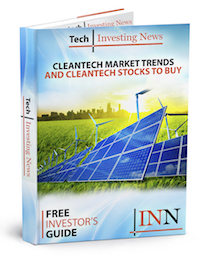 There are many opportunities in cleantech beyond electric vehicles, cobalt and lithium. We’ve found these opportunities and put them in a report just for you.